If you are looking for chill vibes, look no further than the island of Jamaica! 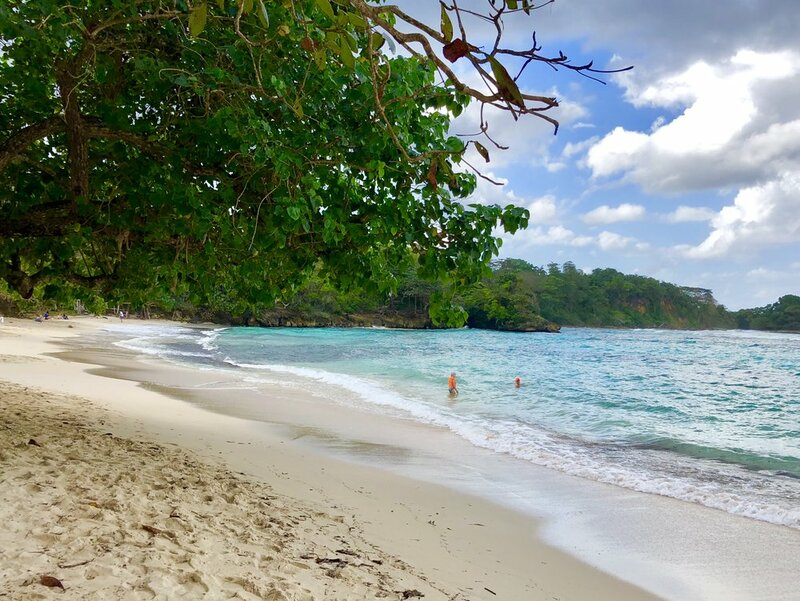 When planning our first trip there three years ago, I had wanted to stay away from the hustle and bustle of the classic tourist cities of Montego Bay or Ocho Rios. I'm sure they're great, but I was looking for a quiet and relaxing getaway, mon, not large cruise ships and party vibes. Which is why I did a little digging and was excited to discover the parish of Portland in the northeast part of the island. Is it relaxing? Let me put it this way – it's pure relaxation station! In fact, we had such a great time three years ago, we decided to come back for another long weekend, this time with Sally and our friends Leslie and Jason. We even decided to stay at the exact same hotel, Goblin Hill Villas. Before talking about the hotel itself, let's talk about getting to Portland. Portland is about a 2.5-3 hour drive from Kingston, and the roads are notoriously covered with potholes, especially the road that runs along the coast on the east side of the island (we even gotten a flat tire on our first trip). We found the faster route was through the mountains (despite what your GPS may tell you). A couple of driving tips: Jamaica is a British commonwealth so the driving is on the left side of the road (whoever is driving should be comfortable with that), there are not a ton of places to stop along the way so make sure you have gas, water, and snacks for the drive, and finally, when driving, avoid potholes at all cost! That said... the drive is worth it!!! 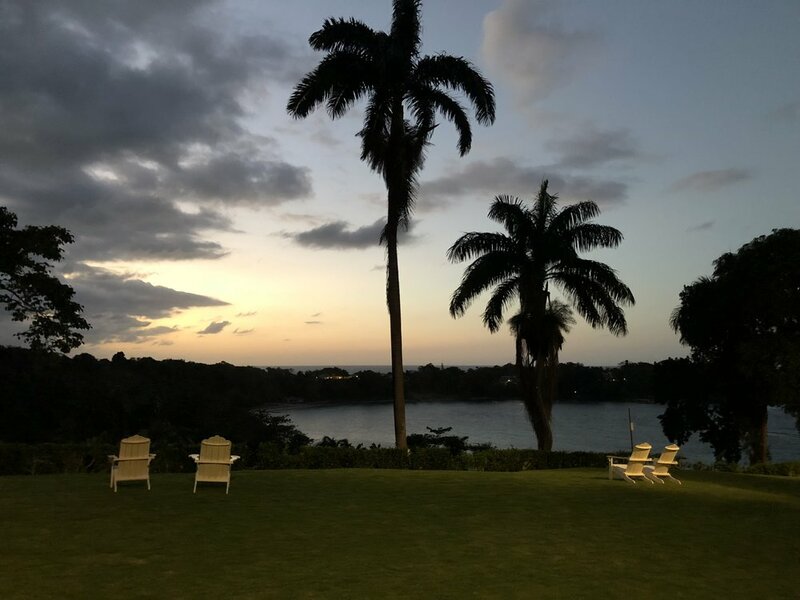 Once you make it to Goblin Hill you will be greeted by friendly and accommodating staff, wide well-kept lawns, and gorgeous views of SanSan Bay! There is something about the hotel that has a bit of a Dharma Initiative from LOST vibe, but I say this in the most loving way! It's beautiful!!! ...just a bit faded. To me, it adds to the charm and it's a great blend of nice accommodations without the stuffiness of a high-end resort. The best part about this place though, is that each villa (they offer one or two bedrooms) comes with a housekeeper/cook! Yes, you read that right. The room comes with a personal COOK! She will prepare all of your meals for you, and all you need to pay for is the price of the groceries (and a tip at the end of your stay). And these are not your average home-cooked meals. Each night you'll feast on a FOUR COURSE dinner of traditional Jamaican fare cooked in the kitchen of your very own villa. Each dinner consisted of a soup, salad, entrée, and homemade dessert. They can do breakfast and lunch too! All with local flair. We were particularly taken by a local green called callaloo. It's a green, similar to spinach. We had callaloo and cheese omelets each morning with fresh fruit. Callaloo also made an appearance in the pepperpot soup one night. When traveling with a toddler, we found these home-cooked meals to be the ideal way to eat! Sally, while adorable, is pretty difficult to take out to dinner these days (especially dinner operating on 'island time'). Having a meal in our own villa where Sally can run around and come back to the table was excellent. It took the stress out of taking her out and hoping she doesn't try to run around a restaurant (we do have some control over our daughter, I swear). If you do stay at Goblin Hill, quick tip. I recommend contacting the hotel prior to your arrival to let them know what you will like the cook to make during your stay so she can have dinner ready the night of your arrival. You also have the option of going to the market with your housekeeper to check out the local foods while shopping. Other good food options outside of the hotel are the jerk chicken stands in Boston Bay, which is apparently the original home to the jerk seasoning! Winnifred Beach has a number of stands on the beach where you can get chicken, fish, lobster, rice & peas, etc. (more on that later) We went to a fancier dinner at the Geejam Hotel, a swanky upscale hotel tucked in the jungle. While it was nice to check out and the food was tasty, I personally preferred eating in our own villa. Enough about food (I'm not a foodie) and on to the ACTIVITIES! I love activities! There are plenty of them in the area. Each morning we took a family swim in the hotel pool. It's a nice pool with hammocks and lounge chairs and Sally just loves swimming. There is also a playground on the property with swings, a see-saw, slide, and a climbing structure. After a swim and play session, we would head out for an activity in the afternoon. Here are our favorites and I would comfortably say MUST SEES! This is about a 3-minute drive or 15-minute walk from the hotel. The Blue Lagoon is a deep spring that offers a variety of shades of blue depending on the time of day and the sunlight. You can swim in the cool deep waters here, but it's also where you can charter a small boat to a tiny speck of an island called Monkey Island. The island is about a 10-minute boat ride where the boat captain drops you off and then later picks you up at the time of your choice! It's about $50 for the boat ride to the island and back. You can also rent snorkel gear for $10/snorkel and do a bit of snorkeling. We didn't end up snorkeling, so I can't speak to the quality of the snorkel experience (maybe not the best?). Where the boat drops you off is a tiny shaded beach with very shallow warm waters, ideal for wading with a Red Stripe in hand. The island is not inhabited (and despite the name, doesn't even have any monkeys) and feels like a private piece of paradise and the most peaceful way to spend a few hours. (It's also an ideal place for photoshoots with friends!). A gorgeous Jamaican public beach with amenities! This beach is about a 10-minute drive from Goblin Hill and is one of the best public beaches I've ever been to. You can swim in the quiet turquoise bath water or enjoy a number of different shacks on the beach serving up fresh food, cold beer, and coconuts that they will open for you and pop in a straw. I can imagine lounging here all day. While it's a public beach, they do ask that you donate a small amount for the local folks who take care of the beach. I think we donated $10, which seemed fine with them. As for the food on the beach, this time we actually had a bitter sweet experience. We were told that we could get meals of chicken or fish for $9 per meal. Sounded reasonable. 4 meals and 4 Red Stripes later, the proprietor gave us a bill for $95. The math didn't add up. She explained that she didn't have any fish so she had to pay someone else to find a fisherman to buy fish! While the meals were fresh, the fish were tiny and the chicken was one drumstick (which also explained why it took an hour and a half to get the food). We ended up settling on a reasonable price, but all that's to say, be clear up front when negotiating the prices of things, including food, trinkets, and any activities. The last time we were on this beach, this wasn't an issue, so it may have been a one off thing, but be careful out there! Overall, I think this beach is definitely one to check out and lounge on while in Jamaica! The drive to where you park the car and buy your tickets is about 30-minutes from Goblin Hill. The rafting is $90 per raft and each raft is built for two adults (and you can add one small child, I believe under 7). You purchase your tickets in a grand-looking white building that is situated where the river meets the sea and the they will arrange a taxi ($20-$25) to take you up to the raft launching point. The drive takes a bit (back through Port Antonio and up a mountain) but the rafting trip ends at the parking lot where you dropped off your car. Now for the fun part. When you arrive to where you pick up your raft, you are assigned a boat captain. We had Johnny who had been a captain for 20 years. Each captain stands on the front end of the bamboo raft and uses a long bamboo pole to push the raft along the river and navigate through the very small rapids. On our way down the river we saw a man walking a raft upstream (this looked super hard!). Johnny explained to us that before you can become a captain, you first start as an apprentice who walks the rafts upstream back to the starting point. Johnny said he did this for about 15 years before becoming a captain! For our trip our cook packed us lunches, but don't worry if you forget your Red Stripe as there are plenty of vendors both in the river and on the banks ready to sell you cold beer, reefer (which I recommend for the ultimately relaxing experience. Come on, mon, it's Jamaica! ), or some rum punch (which is what our friend Leslie ended up purchasing and loving!). The water is crisp and if the sun is beating down on you, you are also able to take a dip in the river to cool off. I was wondering how Sally would do given that she would need to sit in a small place for 2.5 hours, but she was great! We tried to plan it around her nap time so she would sleep, but she was awake an enjoying it the whole time. They added a cushion for her at our feet where she could sit or lay down, so it was definitely comfy for a toddler. When you get to the end of the tour, there are restrooms in the building where you bought your ticket, which you will likely need after drinking beer for 2.5 hours. This is likely my most favorite beach anywhere in the world! There is a perfect little crescent shaped cove and an incredible lagoon with the most beautiful emerald waters. This lagoon is nuts. It's ripe for a photoshoot (especially while lounging on the swings hanging from the trees that bend over the water). The jungle around the lagoon looks like heaven on earth to me (my photos do not do it justice). The water in the lagoon is slightly chillier than the water off the main beach, but I love that you have the two different options for cooling off. You do need to pay $8/person to get into Frenchman's Cove, but I think it's worth it! They also have amenities. When you arrive someone will offer to bring you beach chairs ($2 per chair) so you have a place to lounge in the shade. There are also attentive waiters that come by with a menu of food and drinks. We got chicken, lobster, Red Stripes, and pina coladas. One note. The food is made to order (and takes about an hour) so if you think you might be hungry, get your order in early. There really isn't much more to say about this beach other than it's everything you could possibly want in a beach day! The last tip is to visit Reach Falls. It's a good 40-minute drive from Goblin Hill. We didn't make it on this trip, but Alan and I visited it on our last trip a few years ago. It's the location of the infamous waterfall scene in Cocktail! It's a stunning natural waterfall where you can either swim at the bottom of the falls or hire a guide to walk you up along the waterfall for a ways. The guide will help you scramble up rocks, swim under smaller falls, and find your way to small pools to relax in. Once you get to the top, you can float/swim back down until you get to the top of the main falls. I have little interest in doing anything that looks remotely dangerous, so I opted for the steps down. Alan was braver and jumped off the 20+ foot falls. This trip is one of my favorites! 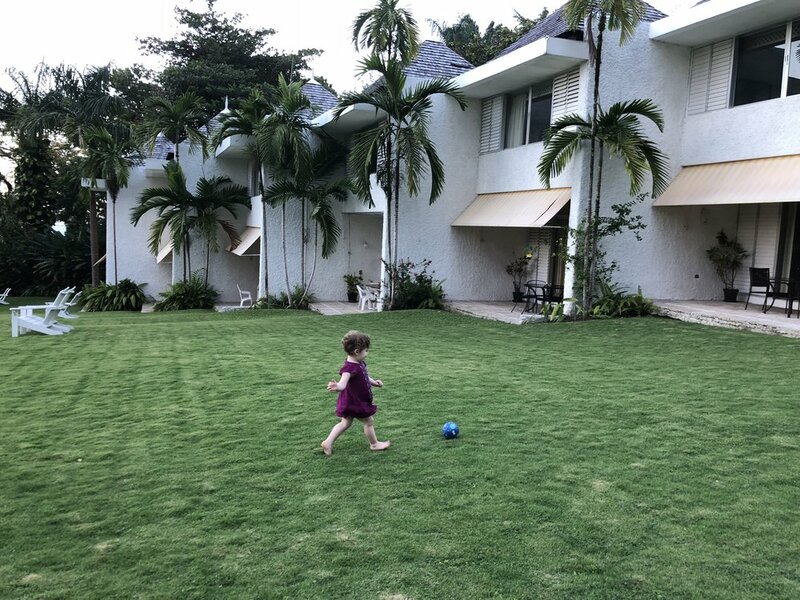 It's toddler-friendly, had incredible beaches, a relaxing and reasonably priced hotel (with a cook!) – what else could you ask for. I'm already planning on going back with an even bigger group of friends for my 40th birthday in a few years. Who's in? One love, mon!